Module is the base class to implement camera-to-USB frame-by-frame video processing. The Engine instantiates one class derived from Module, according to the current VideoMapping selected by the end user (e.g., current image resolution, format, and frame rate setected by a webcam viewing program on a host computer). The Module is loaded as shared object (.so) file according to the VideoMapping definitions in videomappings.cfg and the current VideoMapping selected by the user. any arbitrarily complex sub-hierarchy of Component objects to implement various functionality. Parameter settings from all the sub-components are available to the Module and to users connected over Serial ports of the Engine. This allows one to implement complex vision processing pipelines efficiently and with substantial code re-use. For example, one may first want to implement an EdgeDetector or Saliency component, with Parameter settings for various thresholds, features, etc. One can then create any number of top-level objects that derive from Module and that may contain one or more EdgeDetector, Saliency, etc components in their hierarchy of sub-components, with the implementation in the module simply routing images from one Component to another to create a processing pipeline. process(InputFrame && inframe, OutputFrame && outframe) is called once per iteration of the Engine main loop when the current VideoMapping specifies both a particular Camera resolution and format, and a USB resolution and format. This function should process the received input frame and fill the pixel buffer of the output frame with results. Memory has already been allocated for both the input and output images before process() is called. Because the output image is actually allocated by the USB Gadget driver (and, ultimately, by the Linux kernel), its pixel memory location cannot be moved (hence, do not attempt to copy the output image or replace it by another image, etc; just write pixel data into the output image's pixel array). There is no restriction on video modes or frame rates, except as suported by the Camera hardware, and as limited by USB bandwidth. For most implementations, matching the input and output frame rate is easiest, and means that each invocation of process() would access and use both of the provided InputFrame and OutputFrame (one-input-to-one-output processing pipeline). But this is not mandatory. For example, a motion flow computation Module for use in a flying drone may have 320x240 YUYV 53.0fps inputs and 100x142 GREY 10.6fps output (since output frame rate is 5x lower than input in this example, the process() function would here get, fill, and send the OutputFrame only once every 5 times it is called; implementation of the process() function should keep track of that, e.g., through a member variable that gets incremented each time process() is called). In addition to filling the pixel data of the OutputFrame, process() may also send results over the serial ports (e.g., for use by an Arduino connected to the JeVois platform hardware) using sendSerial(). process(InputFrame && inframe) is called once per Camera frame when the current VideoMapping specifies a particular Camera resolution and format, and NONE as USB output format. This function should process the received input frame and would typicaly then send results to serial ports (e.g., for use by an Arduino connected to the JeVois platform hardware) using sendSerial(). There is no restriction on video modes or frame rates, except as suported by the Camera hardware. parseSerial(std::string const & str, std::shared_ptr<UserInterface> s) allows the Module to support custom user commands. Engine will forward to this function any command received over Serial or other UserInterface that it does not understand. You should use this for things that go beyond Parameter settings (which is already natively supported by Engine) or built-in commands of Engine (see Command-line interface user guide). For example, one could implement here a command called "start" to allow users to start some specific thing. supportedCommands(std::ostream & os) should stream out a human-readable description of any custom commands supported by parseSerial(). These will be shown to users when they type "help" over a Serial port. Every module implementation file should contain a call to JEVOIS_REGISTER_MODULE(MODULENAME) for the module's class. This creates some plain-C entry points that will be used when the module is loaded from a dynamic library (.so) file to instantiate the module. See Tutorial on how to write new machine vision modules for JeVois for examples. Definition at line 228 of file Module.C. Definition at line 233 of file Module.C. The Engine maintains a master frame counter that is incremented on each call to process(), whether or not the call succeeds. The counter is not incremented when a module has not been loaded (e.g., failed to load). The counter is reset to zero each time a new module is loaded. Definition at line 263 of file Module.C. This function may be called in between calls to process() with any received string from any of the serial ports. Some commands are parsed upstream already (like "help", set param value, set camera control, etc; see the Engine class) and will not be received here. Only the ones not recognized by the Engine will be received (i.e., custom commands specific to your module). The default implementation just throws std::runtime_error("Unsupported command"), but some modules may want to override this function to handle custom commands. If you successfully process the command, just return; otherwise, throw, and if your exception derives from std::exception, the Engine will append its what() to the error message issued to the user. When you support commands here, you should update the implementation of supportedCommands() to provide some description of those commands to the users. The s parameter is the serial port that received the command. You can send any results back to that port using writeString() on it. Note that the Engine will automatically add the 'OK' message upon success, so you do not have to send that here. Definition at line 254 of file Module.C. This function is called once for each grabbed video frame from the camera, and it should complete within the camera's frame period in order to avoid dropping frames. The InputFrame and OutputFrame objects are simple wrappers to ensure that the low-level video buffers will always be returned to the low-level camera and USB drivers even if the process function throws at any point during the processing. If any error occurs, it is hence ok to throw from within process() at any time, just make sure your locally allocated resources will be freed, which is usually best achieved by using shared_ptr and similar wrappers around them. The Engine (which calls process() on your module for every frame) will catch any exception an proceed to the next frame. Default implementation in the base class just throws. Derived classes should override it. Reimplemented in jevois::PythonModule, TutorialEdgeDetectionX4, TutorialEdgeDetection, TutorialConvert, and TutorialPassThrough. This function is called once for each grabbed video frame from the camera, and it should complete within the camera's frame period in order to avoid dropping frames. The InputFrame object is a simple wrapper to ensure that the low-level video buffers will always be returned to the low-level camera driver even if the process function throws at any point during the processing. If any error occurs, it is hence ok to throw from within process() at any time, just make sure your locally allocated resources will be freed, which is usually best achieved by using shared_ptr and similar wrappers around them. The Engine (which calls process() on your module for every frame) will catch any exception an proceed to the next frame. Definition at line 271 of file Module.C. Definition at line 279 of file Module.C. Definition at line 287 of file Module.C. Send a string over the 'serout' serial port. The default implementation just sends the string to the serial port specified by the 'serout' Parameter in Engine (which could be the hardware serial port, the serial-over-USB port, both, or none; see Command-line interface user guide for information about serout). No need to override in most cases. Typically, you would use this function from within process() to send out some results of your processing. Note that the default 'serout' Parameter setting in Engine is None. This is to allow users to configure parameters, get parameter values, possibly read the help message, etc before the flow of serial outputs from vision processing starts. Once ready to receive serial outputs, one would typically issue a command 'setpar serout Hard' over the JeVois command line to enable serial outputs to the hardware serial port. An Arduino would issue that setpar commands when it is ready to work. See ArduinoTutorial for an example. Definition at line 245 of file Module.C. 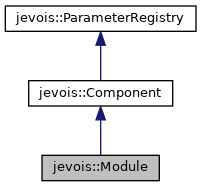 Referenced by jevois::StdModule::sendSerialContour2D(), jevois::StdModule::sendSerialMarkStart(), jevois::StdModule::sendSerialMarkStop(), jevois::StdModule::sendSerialObjReco(), jevois::StdModule::sendSerialStd1Dx(), jevois::StdModule::sendSerialStd1Dy(), jevois::StdModule::sendSerialStd2D(), and jevois::StdModule::sendSerialStd3D(). The format here is free. Just use std::endl to demarcate lines, these will be converted to the appropriate line endings by the serial ports. Default implementation writes "None" to os. Definition at line 259 of file Module.C. Definition at line 267 of file Module.C. Definition at line 275 of file Module.C. Definition at line 283 of file Module.C.